Today we celebrate and give thanks to a man who wasn’t a Loyalist, but when his family tree is shaken, they pop out all over the place. From Samuel and Elizabeth Tilley to William Peters and Charlotte Haines, Sir Samuel Leonard Tilley has an impressive Loyalist pedigree. By the 1820s and 1830s the older generation of Loyalists had passed from the scene. Those who had arrived as children or young adults were now in middle age with children and grandchildren unfamiliar with the war, the migration, the struggle for survival and the creation of a new life. The subsequent generations enjoyed the fruits of the labours of their ancestors. Communities, churches and schools appeared where field and forest had been in 1783, and frame houses replaced log cabins. Some Loyalists enjoyed prosperity unknown prior to coming to New Brunswick with large and extended families and the ability to purchase finery and home decorations. Grandchildren of Loyalists inter-married with regularity and opened their families in turn to new settlers in the County. With the arrival of Scottish and Irish migrants, a new chapter opened in the story of Queens County and New Brunswick. The wounds of revolution were replaced with a movement toward responsible government, economic expansion and ultimately, Confederation, led by a grandson of Loyalists, Samuel Leonard Tilley. Samuel Leonard Tilley was born in the parlour bedroom of the house known to us as the Tilley House, Gagetown, 8 May 1818. His great-grandparents, Loyalists Samuel and Elizabeth Tilley had purchased the little house about 1805 from Dr. John Frederick Augustus Stickles, the local doctor. This silver spoon was found under floorboards of the Tilley House in the 1960s. It belonged to Elizabeth Morgan Tilley, and was made by Saint John silversmith Alexander Munro between 1800 and 1810. The stem is engraved in script with the initials, ET. 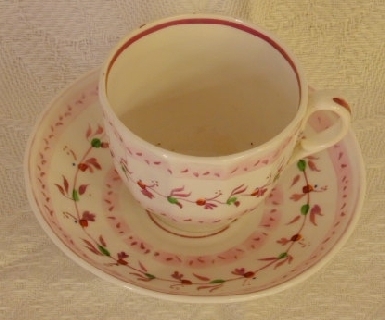 The cup and saucer shown here belonged to Samuel Leonard Tilley’s grandmother, Mary Chase Tilley (c 1776-1866), wife of James Tilley (1773-1850). When Samuel Tilley died in 1814, the house passed to his grandson, Thomas Morgan Tilley (1795-1871) who married Susan Ann Hunt Peters (1798-1876) on 5 April 1817. The young Tilleys moved into the small, original house and commenced construction on an enlargement immediately, finishing in time to welcome the birth of their first child, Samuel Leonard in May 1818. To the original house Thomas Tilley added an spacious entrance hall and staircase, a formal parlour, and a bedroom on the first floor, a wide hall and two additional bedrooms on the second floor. Queens County Heritage has a pair of sugar tongs that belonged to Susan Peters Tilley. The tongs were made by John Hersey, Newcastle, New Brunswick, between 1823 and 1830, and are engraved with the initials, ST. Thomas Tilley was a skilled carpented and storekeeper in Gagetown and he and Susan had a large family of eight children, however their eldest remains the most famous. Young Samuel Leonard was educated at Gagetown at the Madras School, leading an ordinary life. No images of Thomas or Susan Tilley as young people exist; however some time in the late 1820s, they commissioned local artist Thomas MacDonald (the painter of Daniel Babbit and Charlotte Bell) to paint the portraits of their eldest children, Samuel Leonard Tilley and his sister, Elizabeth. The portrait of Samuel Leonard Tilley is a rare image, being the oldest and earliest image of a Father of Confederation. It remained with the Tilley Family until donated to the New Brunswick Museum in 2007. Shortly afterward, at the age of thirteen, Samuel Leonard Tilley left his home for Saint John, to apprentice as an apothecary with a Peters cousin. 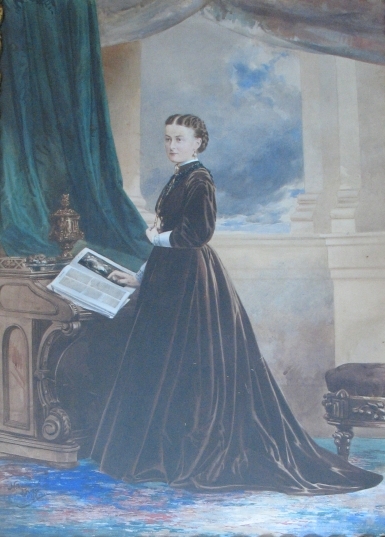 This portrait was painted in the 1840s and features an apothecary chest in the background and various tins and jars. The prosperous young Tilley is rosy cheeked and well dressed as befitting a professional businessman of his time. Samuel Leonard Tilley was partnered with one of his cousins, Thomas W. Peters. The firm of Peters & Tilley advertised themselves as the “Cheap Drug Store”. 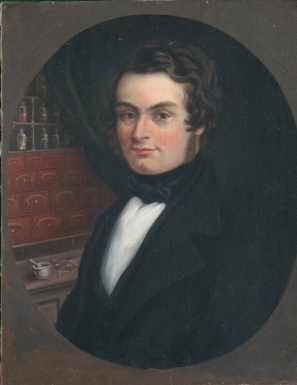 Tilley was certified as a pharmacist in May 1838 and worked with his cousin until Peters’ retirement in 1848 when the business became Tilley’s Drug Store. Tilley held on to the business until 1860 by which time politics consumed his time and career and he sold the business. Samuel Leonard Tilley married Julia Ann Hanford of Portland, Saint John, New Brunswick, 6 May 1843. 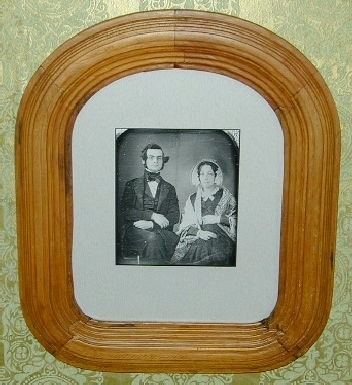 This daguerreotype shows the couple early in their marriage, some time in the late 1840s. By 1850 Samuel Leonard Tilley was at the height of his business career. He was prosperous, married with a growing a family, deep family roots in Saint John and Queens County and could have easily lived out his life a very contented individual. Circumstances, personal conviction and duty were soon to alter that plan. Daily ships arrived from around the world carrying people and goods from far off lands, providing a window on the world to the people of Saint John and all of New Brunswick. The shipping and shipbuilding industries provided great wealth to New Brunswick, making the region one of the wealthiest centers in North America, and certainly the most prosperous area of British North America. Given the proserous nature of Tilley’s business, it is expected that he and his family enjoyed the privileges of a cosmopolitan society. Fine furniture, exotic foods, artists and photographers studios, theatre, societies, churches and fine schools were all available to the young Tilleys. Early on, however, Samuel Leonard Tilley exhibited a serious side and following in the footsteps of his Loyalist ancestors, he felt a duty to serve his fellow citizens and became engaged in a number of local activities including teaching Sunday School. 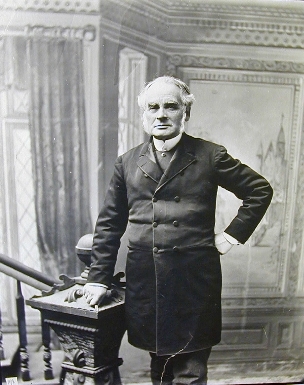 In 1844 Samuel Leonard Tilley, inspired by his religious beliefs, joined the committee of the Portland Total Abstinence Society, working for legislation that would enforce prohibition. The story is told of a brutal murder in the city and Tilley was in the vicinity as a small girl ran for help. The girl’s screams apparently haunted Tilley for the rest of his life since alcohol had been the cause of the murder. When the American Sons of Temperance organization established a chapter in New Brunswick, Tilley soon joined the cause. While not a radical agitator for prohibition, Tilley campaigned with logic and calmness, winning over many converts through his reason rather than passion. Samuel Leonard Tilley soon adapted himself to the political arena. Part of a new generation that dared question the traditional Loyalist view of strict obedience to higher political officers, Tilley agitated for democratic reforms that would bring more control over provincial affairs to New Brunswick and its elected representatives. From that time forward, Samuel Leonard Tilley held political office in one form or another: Provincial Secretary, Premier, delegate to the confederation Conferences earning his title Father of Confederation, federal cabinet minister including Finance Minister, and finally the only person to hold the office of Lieutenant Governor twice. As a reward for his services to Canada and the Empire, Samuel Leonard Tilley was knighted by Queen Victoria in 1879. After his dear first wife, Julia died in 1862, he married the daughter of a good friend in 1867, Alice Starr Chipman, and had two more children, including future New Brunswick Premier Leonard Percy DeWolfe Tilley. Although a reformer breaking the mold of Loyalist political traditions, Sir Samuel Leonard Tilley was also a product of his ancestors: a social conscience, a devotion to duty and public service, a firm belief in God and the moral guidance of the church, and of course, loyalty to Queen and country. Through Samuel Leonard Tilley and then many others down to the present, the legacy of the Loyalists endures in the foundation of our political, economic and cultural establishment. Change over time is natural and the melding of other cultures and traditions created a new society not quite British and not quite American either, but something unique and abiding. Someone Before Us . . .